The planetarium documentary The Hot and Energetic Universe presents with the use of immersive visualizations and real images the achievements of the modern astronomy, the most advanced terrestrial and orbital observatories, the basic principles electromagnetic radiation and the natural phenomena related to the High Energy Astrophysics. High Energy Astrophysics plays a key role in understanding the universe. These radiations reveal the processes in the hot and violent Universe. This science also probes hot gas in clusters of galaxies, which are the most massive objects in the Universe. It also probes hot gas accreting around supermassive black holes in the centers of galaxies. Finally, high energy radiation provides important information about our own Galaxy, neutron stars, supernova remnants and stars like our Sun which emit copious amounts of high energy radiation. 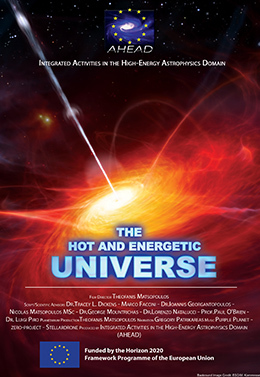 Europe plays a leading role in high energy astrophysics research. The XMM-Newton and the Integral missions, are leading the exploration of the X-ray and gamma-ray Universe. ESA‘s mission ATHENA, to be launched in 2028, will carry the most sensitive X-ray telescope ever and It will be the flagship of all high X-ray missions.